Powers/Abilities: Captain Airstrip-One possesses heightened strength proportionate to Brian Braddock, the Captain Britain of Earth-616. He also has the power of flight, as well as heightened senses. History: (Mighty World of Marvel#13) - Following Merlin's apparent death, Captain Airstrip-One (as well as the rest of the Corps) attended his funeral. He congratulated Captain Britain of Earth-616 for his role in the defeat of Mad Jim Jaspers, who posed a multiversal threat, bowing and greeting him with "CapBrit! Doubleplusgood usmeet!" 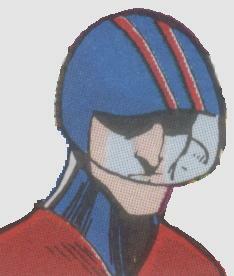 (Excalibur I#43-47) - Captain Airstrip-One (along with other members of the Corps) acted as jury on the trail of Captain Britain, who had been perceived to be in violation of the Corps' morality code. (Mad Dog#10, published by Oddmags) - Captain Airstrip-One began what appeared to be a standard patrol for him, starting at 13 o'clock. He first punished a married couple who were slow to rise out of bed, then administered electrical aversion therapy to a teenage boy watching a salacious music video. He eventually witnessed a parade in London's Victory Square (to honor an increase in the video game ration), greeting Thought Police member O'Brien on his arrival. O'Brien, in a philosophical mood, said to him, "The purpose of power is power! How could it be otherwise? Imagine a boot stamping into a human face forever!" Captain Airstrip-One interpreted this as a direct order, and commenced imagining a boot stamping into a human face ... forever. It is unknown whether this was effectively Captain Airstrip-One's final case. 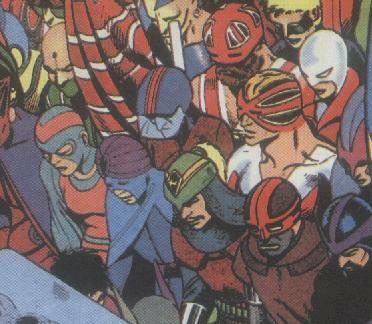 (Excalibur II#1 - BTS) - Presumably, Captain Airstrip-One was among the members of the Captain Britain Corps that were slaughtered by Mastermind and the Warpies. Alan Moore intended Captain Airstrip-One's Earth to be similar to that of the novel "1984", by George Orwell. Most of the dialog is in Newspeak, the degraded English spoken by the proles in that book. O'Brien's philosophical meanderings are paraphrased from Orwell's character O'Brien. The face of Big Brother in the Mad Dog story is that of Henry Spencer, protagonist of the David Lynch film "Eraserhead". Some of the propaganda posters surrounding the parade ground use slogans from David Bowie's song "Big Brother", off the album Diamond Dogs, released in 1974. Thanks to Mike Berry for giving Captain Airstrip-One's correct first appearance. His real name was revealed in the Corps' profile in OHotMU A-Z HC#2. Any of the other innumerable characters with 'Captain' in their names.